Oxygen Forensics updates its flagship mobile evidence discovery solution, Oxygen Forensic Suite 2014, adding forensic analysis support for BlackBerry 10 backups. The new release enables investigators to seamlessly process encrypted BlackBerry 10 backups, extract and analyze information contained in these files. Oxygen Forensic Suite 2014 extracts all information from BlackBerry 10 backups, and parses data contained in Contacts, Messages, Calls and the file system. For data obtained from these sections, the tool can also recover deleted entries. The addition of BlackBerry 10 backups to the list of supported data sources enables forensic experts analyze information stored in last-generation BlackBerry devices. Oxygen Forensics becomes industry-first company to decrypt and analyze the content of the BlackBerry 10 backup with a known password. The latest release of Oxygen Forensic Suite 2014 now includes support for BlackBerry 10 backups, implementing built-in decryption, extraction, parsing and analysis of information contained in encrypted backups. The decryption technology has been licensed from ElcomSoft Co. Ltd., making Oxygen Forensic Suite 2014 the first analytic package on the market to receive access to information contained in BlackBerry 10 devices. The decryption of offline backups produced with BlackBerry 10 devices does not require the use of the actual mobile device. Instead, Oxygen Forensic Suite 2014 makes use of backup files stored on a computer with which the BlackBerry 10 device has been synchronized. In order to decrypt the backup, the original BlackBerry account password is required. Oxygen Forensic Suite 2014 extracts all information from BlackBerry 10 backups, and parses data contained in Contacts, Messages, Calls and the file system. For data obtained from these sections, the tool can recover deleted entries, enabling the recovery of cleared call logs, message lists and so on. In addition, Oxygen Forensic Suite 2014 reads the list of installed applications as well as the corresponding application data files. Supporting a huge application database, the tool can parse and process information contained in application data files produced by a large number of mobile apps. Support for additional types of data available in BlackBerry 10 backups is coming soon. Oxygen Forensic Suite 2014 includes full analytic support for information obtained from BlackBerry 10 backups including the company’s signature Timeline and Links & Stats analysis. The Timeline section implements convenient, single-view access to all user and system activities arranged by date and time. Investigators can track call logs, view conversations and see other types of activities performed by the user during a specified period of time. The Links and Stats section allows investigators reveal social connections between the user of a mobile device being analyzed and their contacts. This section automatically analyzes calls, text, multimedia and e-mail messages, instant messages, chats, social network communications and a variety of other communication activities occurring in all relevant applications supported by Oxygen Forensic Suite. Oxygen Forensic Suite 2014 helps investigators and forensic specialists access and analyze data from a variety of mobile devices such as cell phones, smartphones, communicators, PDA and tablet PCs. Currently supporting more than 7,800 different models, Oxygen Forensic Suite 2014 covers the widest range of mobile devices compared to competition, and allows fully automated acquisition and analysis of supported devices. The unique Timeline feature offers convenient, single-place access to all activities and movements performed by one or several users arranged by date and time. Investigators can track user location at every moment, build and map their historic routes, and clearly see all activities performed by the user at each location. Another signature feature of Oxygen Forensic Suite allows investigators to perform a global search on all devices ever analyzed with the toolkit. The global search quickly reveals any connections (e.g. common contacts, exchanged calls, texts or emails) between the phone owners. Oxygen’s statistical analysis tools allow investigators discover social connections between the users of multiple mobile devices. Calls, text messages and various messengers’ conversations are analyzed to produce charts and tables revealing the users’ closest circle at a glance. Oxygen Forensic Suite 2014 guarantees zero-footprint operation, leaving no traces and making no modifications to the content of the devices. This makes it the tool of choice among government and law enforcement agencies, security services, and forensic organizations in more than fifty countries. Founded in 2000, Oxygen Forensics is the worldwide leading maker of the advanced forensic data examination tools for smartphones and other mobile devices. The company is dedicated to delivering the most universal forensic solution covering the widest range of mobile devices running Android, iOS, Blackberry, Windows Phone, Symbian and other operating systems. Law enforcement and government agencies, institutions, corporations and private investigators, help desk personnel and thousands of private consumers rely on Oxygen Forensics products to ensure evidence availability in the event of mobile device data analysis and recovery. Oxygen Forensics customers include various US and European federal and state agencies such as the IRS, US Army, US Department of Defense (DOD), US Department of Justice, US Department of Homeland Security, US Department of Transportation, US Postal Service, US Supreme Court, European Commission, London Metropolitan Police, French National Police and Gendarmerie, PricewaterhouseCoopers, Ernst & Young, and many others. As a result, Oxygen Forensic Suite receives great response at forensic conferences, exhibitions and trainings, and occupies a spot on the top of the list in relevant tests for extracting more data than competitors. Founded in 1990, ElcomSoft Co.Ltd. is a global industry-acknowledged expert in computer and mobile forensics providing tools, training, and consulting services to law enforcement, forensics, financial and intelligence agencies. ElcomSoft pioneered and patented numerous cryptography techniques, setting and exceeding expectations by consistently breaking the industry’s performance records. ElcomSoft is Microsoft Gold Independent Software Vendor, Intel Software Premier Elite Partner, member of Russian Cryptology Association (RCA) and Computer Security Institute. More information about Oxygen Forensics and its forensic solutions is available at http://www.oxygen-forensic.com. 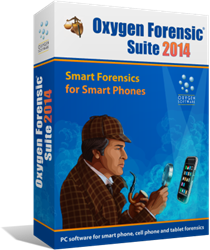 Oxygen Forensic Suite 2014 Breaks into BlackBerry 10 Backups Oxygen Forensic Kit. Rugged Oxygen Forensic Suite Whitepaper.